Welcome to Comoon Boutique Villas, contemporary luxury living offered at affordable rates, in a stunning hillside serviced villa resort. 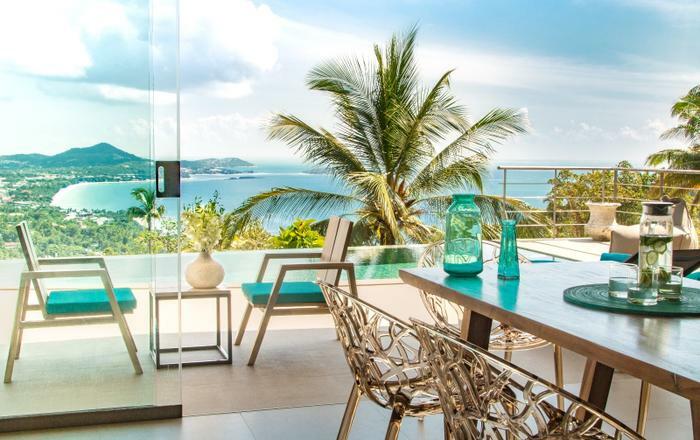 Each of the 5 villas and the Penthouse are drenched in the unending sea views of Chaweng Noi and beyond and are ideally located minutes from the go-to destination of Samui’s Chaweng beach. 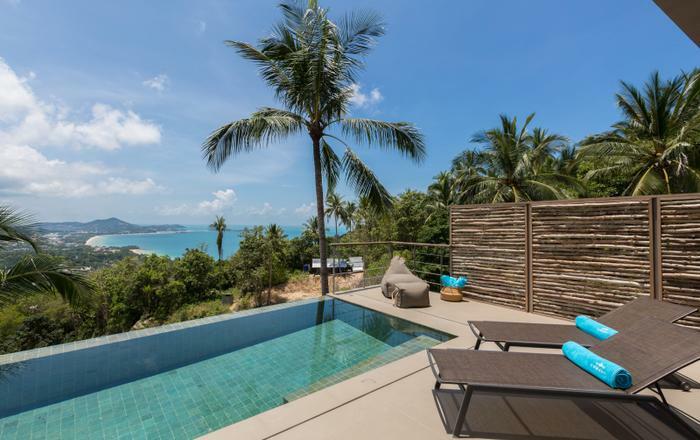 Revealing 5 private pool villas and one large Jacuzzi penthouse, Comoon Boutique Villas creates a lifestyle for guests with a taste of tropical indulgence where privacy and luxury are synonymous. Whether guests are holidaying with a partner, on a honeymoon, a small group of friends or a wedding party. Comoon Boutique Villas offers a variety of 1,2 and 3 bedroom villas, within a tropical garden for that perfect private holiday combination. With cutting edge architectural design and an ultra chic interior feel, further enhanced with 5 star services. 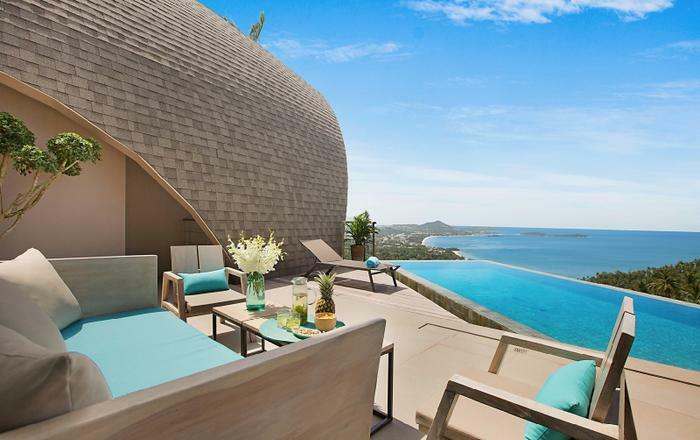 The Comoon Boutique Villas give guests that attention to detail, they each deserve. 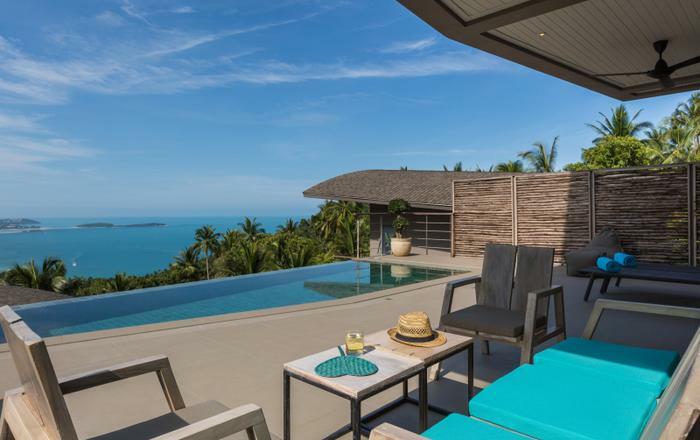 Lanta is a custom designed villa with captivating azure sea views throughout, offering guests a contemporary lifestyle whilst enjoying island life in affordable luxury. Made up of 220 sq. meters of living area, that has been designed to maximize it’s sense of space and location. Floor to ceiling glass doors further enhance the breathtaking vistas blending the indoor living space and that of the pool deck seamlessly. The spacious open plan living area for 4 people offers comfortable sofa seating with Smart HD TV with Netflix access and Wi-Fi throughout. 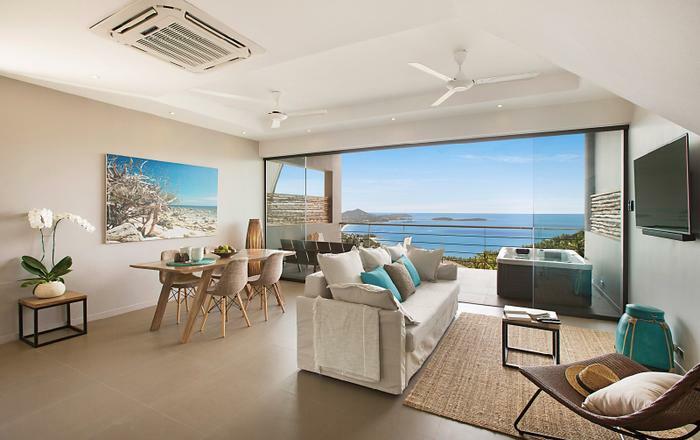 Dining is set for 4 and should guests choose to cook, Lanta also offers a high-spec’d western-kitchen with top end appliances, enhancing this home away from home feel, leaving guests wanting for nothing. 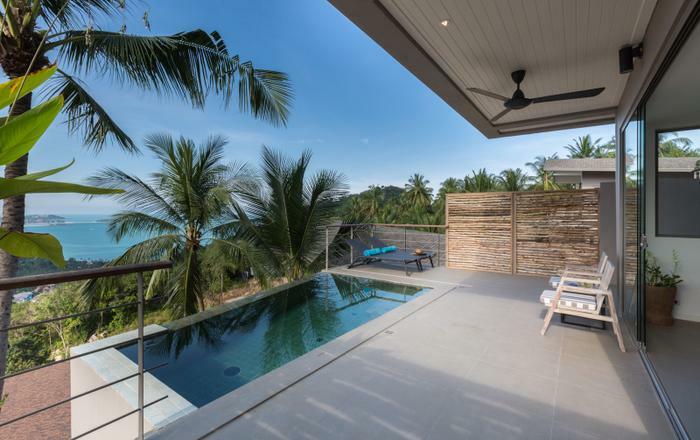 The private pool is ideally located close to the open plan living space and sun worshippers will not be disappointed with the surrounding sun deck and cooling Balinese tiled pool, immersed in endless sea views. Lanta offers 2 upstairs bedroom retreats with a gorgeous contemporary interior style dressed in a colour palette of the endless ocean views. The Master bedroom is spacious by design with a king sized double bed and floor to ceiling glass doors, optimizing the island backdrop with private terrace and sun loungers for 2. The second bedroom offers a similar clean interior design with 2 single beds, oversized glass doors that seamlessly disappear, blending onto the covered private balcony. Both bedrooms feature spacious en-suite bathrooms also affording sea views with innovative interior design featuring an office space and walk in wardrobe. Each bedroom has climate-controlled air conditioning, ceiling fan and personal safe. With a desire to ensure that all your holiday expectations are met, Villa Lanta offers a variety of in-villa services that can be tailor made through the team of multi lingual Villa Managers, offering a variety of concierge services, making for unforgettable holiday experiences. Guests can enjoy daily housekeeping where the dedicated team ensures that each villa is kept in pristine condition. A Private Chef is available upon request to cook some of your personal Thai favourite dishes or treat you to a culinary journey of new delicious Thai treats custom made for your palette. Villa Lanta also offers a snacking menu, ideal for those moments when just a little something is needed whilst relaxing by the pool with no desire to move anywhere. The in-house spa service offers guests a variety of massages and other beauty and health treatments, all in the comfort of guest’s own personal space. If guests wish to indulge in more sporting geared pursuits, Comoon offers it’s own fitness centre with a selection of fitness equipment. If guests would like to enjoy yoga, private and group classes in a variety of styles can be arranged with the Villa Manager. Guests wishing to try the traditional Muay Thai training can be assured of a cardio experience second to none with excellent private coaches. One round trip complimentary transport to and from the airport is provided. Additional transfers will can be arranged at THB 1500 per return trip. All Payments are forfeited but credited for 9 months from the date of the cancellation confirmation by our reservations department.